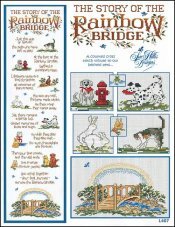 Rainbow Bridge [C5052] - $12.00 : Yarn Tree, Your wholesale source for cross stitch supplies. Cross stitch pattern by Sue Hillis Designs. A tribute to pets who have left us with dogs, cats, bunnies, fish, hamster, and a bridge with a rainbow at the bottom. Stitched on #7698 28ct Lugana antique white. Stitch count 127 wide x 497 high.